Great family Getaway!!! Close to skiing, shopping & dinning. 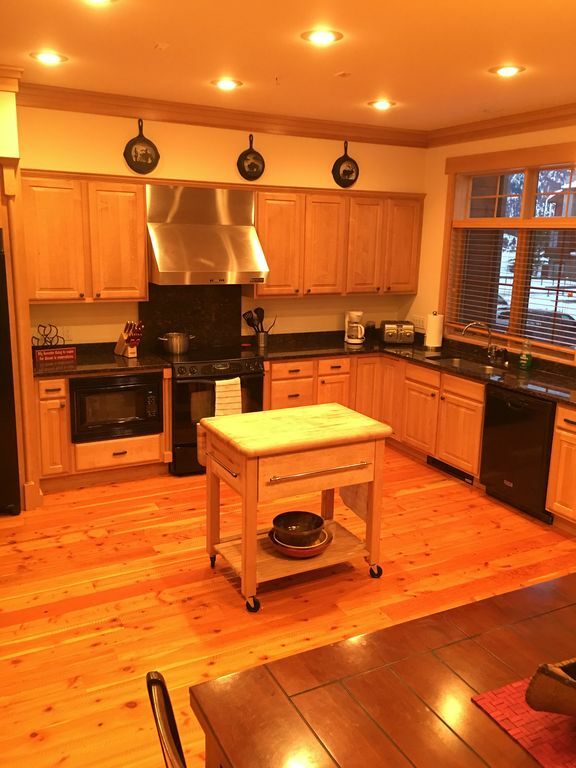 Big sky condo, 2/3 Bedrooms (media room converts to bedroom), 3 Baths (Sleeps 8-10). Enter through front door to the large entry hall. Bench and racks available to remove and hang your ski gear are accessible from either the front door or the garage. The first floor media room has queen size sleeper sofa and 40” TV with satellite/DVR and a private patio out back with a breathtaking view of the mountain. There is a large bath, closet and linen storage adjoining the media room. On the second floor you’ll find a terrace off kitchen and the living room. A huge eat-in kitchen, full laundry and comfortable living room with 40” TV/DVR make up the second floor. This is where you’ll cuddle up in front of the cozy wood-burning fireplace and enjoy the view of the mountain. One more flight leads to the Master Bedroom/bath with king bed and 32” satellite TV. The second bedroom sleeps four with twin over double and trundle. This bedroom also has a private bath. Located in the Meadow Village of Big Sky, this home is close to everything. Bars, restaurants, and groceries are a short drive down the hill and you can have groceries delivered to your door. The base lodge at Big Sky Ski Resort is a short ride from your home. During ski season a free shuttle bus runs prescheduled loops and picks up less than ½ block from your door and delivers to the base facilities at Big Sky. Newly constructed half pipe, jumps and many pre-fab structures make Big Sky a great adventure for snow boarders. Enjoy the Big Sky zip line and fly above the skiers! One of the World’s finest cross-country skiing facilities is located at Lone Mountain Ranch just down the road. Snow shoeing and cross country skiing run through the property. World class fly fishing is available on the Gallatin, Madison and Yellowstone rivers. the Arnold Palmer designed Big Sky Golf Course is less than a mile away. Walk to the Arnold Palmer Golf Course, enjoy hiking, walking or mountain biking. The landscaping creates a private park like setting with babbling brook, pond, waterfall and lots of grassy area. The entire development is in a preserve on the Big Sky trail system with lots of beautiful walks, skis, or bike rides available, plus much wildlife viewing! Our guests also have exclusive use to our clubhouse, which features summer outdoor swimming pool and hot tub (summer), fireplace, and full kitchen. Big screen TV makes it perfect for parties or gatherings. The Yellowstone National Park boundary is about 20 miles away and the town of West Yellowstone is about 40 miles south of the entrance to Big Sky. Summer or winter; Yellowstone is a huge hit with both children and adults! Hundreds of miles of unique hiking trails range throughout the entire area both inside and outside the park. Big Sky is the best kept secret in the country. Enjoy challenging ski slopes with virtually no lift lines. Come enjoy Big Sky! Year round activites, Close to shopping. Minutes to ski resort. Small town atmospher and no crowdes. This home is just the right size for a small or medium size family. With infloor heating and a wood burning fire place to keep you warm on the coldest day. There is a gormet kitchen equipped with Jenn-air appliances and large dinning area. Every bed is outfitted with memory foam mattresses to maximize your comfort while staying here. This condo is perfectly placed close to city center,shops and grocery stores. Located next to the Arnold Palmer golf course and Shuttle pick up stop for big sky resort your never more than a few feet from something to do . With a club house in the complex that is completely outfitted for group parties or intimate gatherings. There is a community pool, and hot tub for your enjoyment. The condo was beautiful & was the perfect size for 8 (3 families). We each had our own room/bathroom. The kitchen had everything we needed. We loved being close to groomed trails (right out the door) for cross-country skiing. We were also just a short drive to town for restaurants, shopping & groceries. It was our first time in Big Sky & we DEFINITELY plan to come back & stay at the same place! We thoroughly enjoyed our Thanksgiving holiday visit at this comfortable and well furnished condo! After a long ski day it was nice to return to an inviting home rather than to a hotel room! We enjoyed cooking our meals here, walking on the golf course out back and sitting in front of the fireplace in the evenings! Great location and super clean, well appointed place! The kitchen was well stocked, beds were very comfortable and there was plenty of room for our whole family. Elizabeth was quick to respond and very accommodating when we got our dates mixed up! We would rent here again for sure! This condo was just what we were looking for. It was nice and spacious and well-equipped. We had a wonderful time. Perfect for our needs. Nice kitchen area. Great for a holiday feast. Wonderful condo! We had everything we needed! Loved having humidifiers for bedrooms! Deep 🛀🏻 was luxurious. A lovely condo that gave all the comforts of home after a long day exploring Yellowstone or the great outdoors that only Montana can offer. Our large family highly recommends it! Please be aware there is a Non-refundable $195.00 cleaning fee for all bookings.